There’s so much to do on the island of Maui, but most visitors don’t know where to start. We’ve decided to list fun things to do in Maui to give our viewers locally preferred options. Without a doubt, driving along the Road to Hana is one of the best things to do in Maui. With endless waterfalls, hiking trails, ocean cliffs and gorgeous scenery, this is a road trip you’ll never forget. 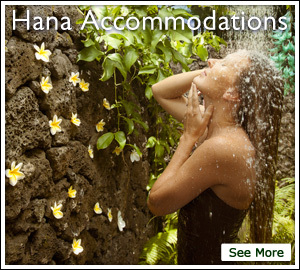 Really, the best way to experience all that Hana has to offer is by staying in Hana for a few days. If this isn’t an option, the day trip is still wonderful. We recommend those that get car sick to not drive all the way to Hana Town. The Road to Hana is about the gorgeous views and waterfalls along the way. Drive till you feel 1/2 content, and turn around. Driving the entire road there and back will take over 5 hours without stopping. Make sure to get a comfortable rental car. Or if you want to truly relax and enjoy the trip to the fullest, Take advantage of knowledgable guides and spacious, air conditioned vans with Valley Isle Excursions. Anyone can cruise the island in a new convertible Mustang, but some choose to relive their pasts with classic cars. On Maui, you can rent all kinds of exotic cars as well as Harley Motorcycles. With all the great drives in Maui, it’s nice to ride in style. Maui Roadsters offers an assortment of beautiful 1957 Porsche 356 Speedster reproductions for full day (12 hour) or half day (6 hour) rentals, perfect for cruising to scenic spots like Hana, Nakalele Blowhole, Upcountry and along Maui’s North shore! One of the cheapest Maui activities is snorkeling. Renting a set of snorkel gear only costs a few dollars – we recommend the Deluxe Snorkel Rental with Boss Frog’s – and the snorkeling just off shore is great. You can look at a Maui snorkel Map, or decide on a boat trip to Molokini Crater. Depending on the conditions, one or the other will provide some great snorkeling with plenty of marine life. We especially recommend snorkeling Molokini Crater because it has protected waters and plenty of sea life. If you’d like to experience how the ancient Polynesians arrived in Hawaii, you can join the Outriggers Canoe Club for a trip in South Maui waters. This is great exercise and a fun and affordable way to see the island. Hawaiian Paddle Sports also offers outrigger canoe and cultural tours, and for experienced paddlers or cross-over athletes, even a challenging paddle to Molokini Crater for a unique and memorable snorkeling experience. This is by far the best canoe tour we’ve done in Hawaiian waters. With many luaus on the island, you can pick the perfect experience for you and your guests, from intimate settings by the ocean to larger productions at resorts throughout the island. All Maui Luaus come with a show of hula dancing, history, and usually at least one fire dancer. This is a great way to experience some of Hawaii’s most interesting culture, watch the sunset and spend a memorable night under the stars with family and friends. Maui is known for it’s diverse and impressive cuisine. Culinary masters from all over the world have come to Maui to share with its visitors some fantastic flavors. Having paradise as a backdrop at the Maui Tropical Plantation while enjoying fresh island food is really an event in itself. Have Maui personal chefs treat your palette to paradise at Maui Chef’s Table. For a truly memorable land activity on Maui, head out for an epic day of volcano hiking with the folks at Hike Maui. Their 7 hour, 4 mile guided hike through the otherworldly landscape of Haleakala Crater, an area larger than that of Manhattan, includes snacks, lunch, and plenty of breathtaking views you’ll remember for a lifetime. Guests must be at least 8 years of age. Perfect for adventurous families, couples, and solo travelers! Visit Hike Maui or call (808) 427-0849 for more information. Tasting the freshest pineapple on Earth while learning about the history of Maui through this important crop really can’t be beat. Great views, fun guides, delicious varieties of pineapple, a deeper understanding of the island, and a lot of fun await you during a Maui Pineapple Tour. Located in a private studio owned by Master Glassblower Ryan Staub, Moana Glass offers Maui visitors the opportunity to create their own island-inspired souvenir during a private glassblowing class. Lessons are taught by Maui’s leading local glassblowers, and you can choose from an assortment of stunning designs, from hearts and bowls to fish, cups and more. This hands-on experience is an excellent way to channel your inner creativity and learn a new skill in paradise, and classes include all safety equipment and step-by-step instruction. Return home with your very own glass-blown creation, and take a free tour of the Moana Glass studio to appreciate the intricacy of this fun artistic practice. Call (808) 763-6338 to reserve your spot. With locations on the slopes of Haleakala, Kaanapali’s West Maui Mountains and over/through the Maui Tropical Plantation, ziplining is a fun way to experience the diverse landscapes and views of Maui. Mill House Restaurant and Bar – This has quickly become our favorite restaurant on Maui. Great views, delicious food, and unique cocktails. Preserve at Travaasa Hana – Headed to Hana? Stop at the beautiful Travaasa Hana for excellent Hana Fusion dishes. Learn more at Maui Dining for recommendations on everything from food trucks to fine dining restaurants. Maui has no shortage of photo-worthy locations and landscapes, which are worth exploring beyond the lens. Iao Valley, with its picturesque streams, lush greenery, and the iconic Iao Needle, offers world class photo opportunities for those with the right equipment. Call (808) 735-3838 or visit HawaiiCamera.com to rent professional quality gear to help you get the best photos. The guided Central Maui, Upcountry & Haleakala Tour with Valley Isle Excursions is the ideal way to tour and learn more about this stunning area, as well as nearby hotspots like the Kepaniwai Gardens and Maui’s favorite historic local towns. Even better – the tour includes round trip transportation, breakfast, and a scenic Upcountry picnic. A riveting and highly entertaining activity for the whole family, head to Wailuku Town to experience Maui’s new escape room thrill at Mystery Maui. Gather your savviest friends and family members for this clue-filled, unique live experience that will challenge you to solve one of two mysteries in 60 minutes or less in order to escape the room. This exciting activity is ideal for groups of 2 to 6 people, and leaves plenty of time to enjoy the rest of your day on Maui. Reserve your mystery experience online or by calling (808) 249-2062. An affordable and exciting way to get out on the water is on Molokini snorkeling tours. These tours will take you out snorkeling as well as whale watching in season. One of our editors has been close enough to a humpback while rafting that he could touch its back. When was the last time you painted a masterpiece in paradise? While others are scrolling their pay-per-view at the hotel, you could be sipping a glass of wine and painting a sunset or a sea turtle! With the guidance of their Partista (Party Artist), your level of expertise won’t matter. You’ll take home a work of art and a few priceless memories. If you’re seeking a family-friendly activity that will have your heart pumping in no time, the Wailuku-based Ultimate Air Trampoline Park is where it’s at. With tons of trampoline jumping areas, a foam ball pit, basketball hoops, there are plenty of ways to keep the keiki – and yourself – entertained at this 25,000 square foot indoor activity center. Reserve your trampoline pass by the hour, or get a full day unlimited pass for $25 (as of 11/15/18). All jumpers can grab a pair of Ultimate Air socks onsite, and head off for a day of fun out of the sun. Guests of all ages are welcome to join, and are encouraged to book their spot online or by calling (808) 214-JUMP. With gorgeous campgrounds all around the island, as well as on our neighbor islands, camping in Maui County is a wonderful and cheap way to visit. The hikes around the various Maui campgrounds are spectacular. Need camping gear? No worries, Camp Maui X offers rentals of everything you’ll need, including trucks and SUVs complete with rooftop camper setups for an epic Maui camping experience! Maui Bottom fishing can be done on any of the dozens of charter boats out of Maalaea Harbor or Lahaina Harbor. Maui’s ocean has some beautiful warm water fish. Maui is one of the easiest places in the Nation to get hitched. Our island has more weddings on it than anywhere else for good reason. Maui’s beaches are perfect for small weddings. It’s pretty much always a good idea to get a wedding planner for a Maui wedding. Most people have small weddings on Maui in order to relieve stress and make life easier. Having a planner makes it far less difficult to lock every detail down. From Wailea and Kihei to Lahaina and Kapalua and everywhere in between, Maui’s Best Massage comes to you! You won’t have to lift a finger or leave your room to get a 5-star massage from these expert therapists! Pick from relaxation, deep tissue, or Lomi Lomi and the aloha spirit will be yours for the taking in no time. They also have a new studio in Wailea at 161 Wailea Ike Place, suite A105-2. If you are in Hana after that windy drive, you’ll be in heaven at the Spa at Travaasa Hana. From head to toe, they have treatments for everything you’d want! They offer facials, waxing, body treatments and make sure to indulge in their state-of-the-art steam room. Finish off with a dip in their lava rock whirlpool, and you’ll be in heaven! Riding from the top of Haleakala down to the base of the volcano is incredible. You’ll enjoy overwhelming views of all of Maui as well as the many sweet fragrances of the countryside while cruising downhill on a bike. Maui bike tours have become one of the most popular activities on the Island. For the more adventurous and active travelers, we highly recommend a full day rappelling tour with Rappel Maui, who specialize in jungle and waterfall rappelling deep in the remote areas of East Maui. Travel along the Road to Hana for a day of hiking, rappelling and swimming in freshwater pools, all with the help of experienced canyoneering guides. Participants must be at least 10 years old, but beginners to advanced levels will enjoy the thrill and scenery! Call 808.445.6407 for more information. Maui Sailing is an easy and fun thing to do with the many large vessels on the island. Popular boats like Four Winds Maui and Trilogy Excursions will take you snorkeling, whale watching, or for a romantic sunset cocktail cruise. South Maui’s Turtle Town is an excellent location to see Hawaiian Green Sea Turtles up close and personal. Frogman Charters offers affordable, relaxed snorkeling at this popular spot. Visit Malolo Charters or call (808) 856-4274 for more info. Just remember not to touch or chase the turtles. Mahalo! To this day, one of the best experiences we ever had was renting stand up paddleboards and paddling with a friend from Kamaole Beach Park 1 all the way to the south end of Keawakapu Beach and back. The water was calm and clear, and it’d been a full moon the night before. Because of the full moon, the manta rays were everywhere! We enjoyed coasting above mantas, schools of fish and vibrant reef. With polarized glasses, it ended up being one of the best ocean experiences of my life. Rent boards from Island Surfboard Rentals at (808) 281-9835. Though most of the glory is stolen by the Big Island’s Kona coffee, the Valley Isle grows delicious coffee as well. Our Maui coffee farms are small and offer very personal and unique flavors. Get some for your trip and take some home! Great Hawaiian healers are world renowned for their massage and yoga techniques. If you enjoy the serenity of meditation and yoga, take a class, or find a quiet place on a sea cliff to experience what these spiritual people know so well. Maui has a wonderful array of teachers and studios. The Travaasa Hana has small yoga classes and guided meditation. On your next journey to paradise, why not get off the beaten path and head to Maui’s lesser known neighbor island of Lanai for an unforgettable snorkeling and boat experience. Depart from Lahaina Harbor on a spacious double decker catamaran for a cruise across the ‘Au’au channel – keeping an eye out for Hawaiian Spinner Dolphins, humpback whales, Hawaiian Green Sea Turtles along the way – before arriving at the first of two scenic snorkeling areas. Enjoy the natural beauty of The Pineapple Isle on this half day tour, which includes a full buffet lunch, water slide, snorkel equipment, guided instruction and more. Visit Hawaii Ocean Project or call (808) 667-6165 for more information.